THE CATHOLIC BISHOPS....ARE WE SLOW-DANCING TOWARDS REVOLUTION? Even in the face of a decades-old and worsening national predicament in the homeland, the CBCP and Catholic followers do not want any radical change in our society. They seem to believe or be mislead that prayers will lead to miracles. The Spanish friars of yesteryears have been replaced not by native, secular clergymen of the heroic GomBurZa variety, but by native versions of the Spanish friars and American missionaries, most of whom were reactionaries, content with their comfortable lives under the status quo while teaching the faithful to practice escapist piety, to forget their dire predicament and suffering, and to look forward to a heavenly afterlife. Historically, the Christian Church (Catholic or Protestant), where it is or has been the majority, becomes a defender of the status quo. The revolutionary Christ who was crucified by the Romans for being a "de-stabilizer" has been sold out by his so-called modern disciples. Actually, this is characteristically true of all religions that started as a minority, revolutionary cult or sect. Our mainly native Catholics, most especially educated ones and middle class -- have either ignored or not learned from the ascendancy of their Church-anointed "religious and prayerful" Cory Aquino, who grossly failed (we do not have to recount the results of her governance here). We, the so-called educated, should know and do more. We the so-called educated should acknowledge these realities and work with the impoverished majority instead of blaming them. Or all the educated and middle class might as well leave the country and not come back (if we could when we want). But what are the present alternatives? When most of the major oppositionists to Arroyo are similarly incorrigible and unconscionable opportunists. When a number of them deserve to be put against the wall and shot or put at least behind bars and the keys thrown into the China Sea. Different faces, same people who would use their "gold, goons and guns" to have their way. They are probably church-going Catholics too; these practitioners of "split-level" Christianity. They call all who practice democratic dissent, including those who are Filipino nationalists and/or practicing authentic Christianity as either "communists" or "terrorists" to rationalize their state-sponsored terrorism committed against dissenters. They do not get bothered, so calloused in heart and mind, by their thievery of government coffers, their corruption and cooptation with foreigners which does violence to the young, the old and the sick, to the ordinary worker and their family: by depriving the majority of the native citizenry of food, medicine, and other essential human needs and services, such as proper education, health care, etc. ; their cooptation with the World Trade Organization (WTO) that lead to the death of our native agriculture and industry, consequent loss of millions of jobs and the pillage of our national patrimony. [http://thefilipinomind.blogspot.com/2005/06/multilateral-punishment-wto-and.html]. Now, we have economic deterioration, political deterioration which are ingredients for a revolution. Is a bloody revolution and/or upheaval imminent in our homeland then? I venture to say NO although I am convinced that it is the only way for radical changes, given the almost 60 years of pleadings for peaceful changes (reforms) and promises by the political leaderships that never materialized. Any revolution against the Arroyo regime or any governing substitute is untimely and irresponsible. A timely and responsible revolution has to have a good probability of success. Timely in the sense that a significant number, if not majority, of the native citizenry are primed for it; responsible in the sense that the native citizenry understands the reasons for it; and successful in the sense that the cost, i.e. human lives to be lost or injured, will be selectively minimized and bring to fruition true and fundamental changes in the economic and political systems and social institutions; all for the "common good" of the native, Malay Filipinos in the homeland. It is only then that a successful revolution can be realized. 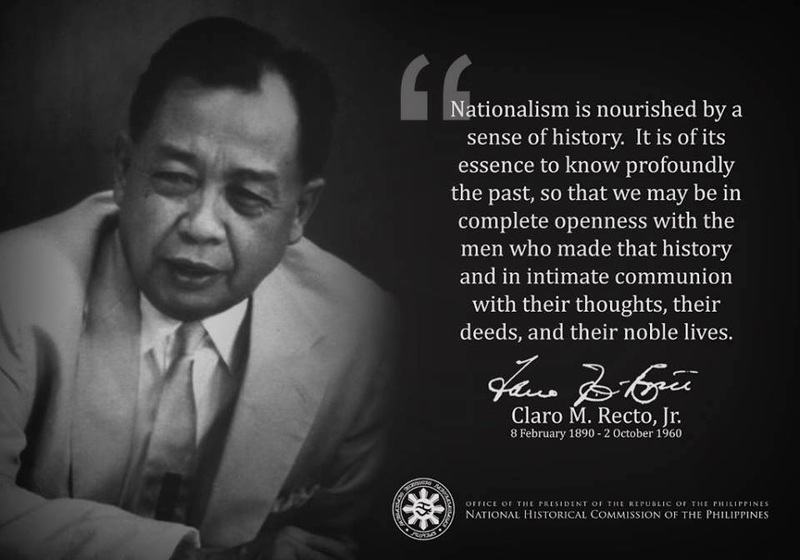 This educational process for fostering Filipino nationalism among the majority will not be an easy task since the International Monetary Fund/World Bank/Asian Development Bank (IMF/WB/ADB) and WTO have imposed pressures on our national educational system to discourage study of our nationalist history. Thus the need for informal education via "teach-ins", conferences, etc. common during the premartial law/Marcos Dictatorship years. With nationalism instilled, these foreign financial institutions that built, in cooperation with our Americanized native technocrats, the millstone of odious foreign debt on our people have to go. Of course, we should not forget who the US supports, since America has always thrown its weight around whenever political upheaval seems to blow up in our homeland. Its Philippine Desk plans and coolly acts to place their bets on the surely, Americanized minds among native politicians, technocrats and military officers. In short, to identify and support Filipino leaders whose Americanized minds will continue to protect American economic and military interests instead of their own people and homeland. Thus America is vehemently against Filipino nationalists and not necessarily against communists, who it has learned to do great business with, as the mainland "Communist" Chinese. An instance of support for Americanized minds: during one of the almost successful attempted coups against Cory Aquino by the RAM officers -mostly PMA Class 1971(attempted takeover to install the AFP as the new political/ruling elite), USAF jets flew over the rebel RAM soldiers. The RAM officers and their followers got the message and quit; that's how cowardly, unresolved and weak we Filipinos are; always allowing a foreign power, our former colonial master and now neocolonial master, to call the shots. America, itself now effectively and efficiently controlled by its transnational corporations, with its citizenry made content and quiet with conspicuous consumption, kept ignorant, distracted and misinformed of its foreign affairs (which lead to hatred for America --thus to the American citizens' surprise) has conveniently forgotten its revolutionary origins and heritage. There's an error frequently made by economists in attempting to model the economy: "fallacy of composition," which assumes that because the parts of an entity (e.g., the RP, the USA) have a certain property , therefore the entity does as well (e.g., Filipinos, US nationals). You are succumbing to this fallacy. First, the Filipinos I have met are not homogenous in personality; some are very brave, others defiant by habit, others frivolous, others serious and philosophical. This, in turn, depends on the situations they are responding to: students, protest marches, industrial workers, doctors, nurses, etc. RP society reflects the interplay of different class and sectional interests. The USA is the same way. I am hardly surprised at your resentment of US nationals; but does your life, or that of anyone you know, resemble the forward-leaning figures in a Chinese Socialist Realist painting? If you cling to vilifications and pat slogans, logical fallicies, tautologies, and recursive resentments, you'll probably bore the pants off anyone you meet. If you want to do anything constructive about the mess Filipino politics is in, you really need basic reasoning skills. The PRC is not exactly an exemplar of Marxist-Leninist thinking nowadays; rabid anti-US nationalism has always been a great ally of US commercial interests. Also, hatred of another country is paralyzing. If you think the RP should be an autarky, give life without imports (or export markets) a shot, and see how it works. Cheers. I have gone past my student years eons ago of what seemed filled with empty slogans to most students and the knowleadgably ignorant,etc. If you still hear and see only slogans in the streets (or infer that my posting as sloganeering), it means those conditions that brought about the slogans are sadly still around in my homeland. However if interested, read some of my previous postings. Then hopefully you may have a better idea of "what/why and where" I stand. Thank you again for reading my blog. And please continue doing so. Then we can talk more.